This article is about the video game. For the roller coaster, see Sonic Spinball (roller coaster). Sonic the Hedgehog Spinball, commonly abbreviated to Sonic Spinball, is a 1993 pinball video game developed by Sega Technical Institute and published by Sega. It is a spinoff of the Sonic the Hedgehog series set in the universe of the animated series Adventures of Sonic the Hedgehog. Players control Sonic the Hedgehog, who must stop Doctor Robotnik from enslaving the population in a giant pinball-like mechanism. The game is set in a series of pinball machine-like environments, and Sonic acts as a pinball for the majority of the game. Sonic Spinball was developed by the American staff of Sega Technical Institute, as the Japanese staff was occupied with developing Sonic the Hedgehog 3 and Sonic & Knuckles. When Sega management realized that Sonic 3 would not be completed in time for the 1993 holiday shopping season, they commissioned another Sonic game. The game was hastily designed amid time constraints, with most work taking place over two months. Sonic Spinball was released for the Sega Genesis in November 1993 and for the Game Gear and Master System in 1994 and 1995 respectively. 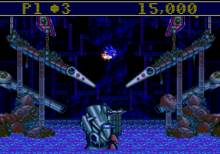 Sonic Spinball received mixed reviews, with critics praising the novelty and graphics but criticizing the controls. A second pinball game, Sonic Pinball Party, was released in 2003, and a Sonic Spinball spinning rollercoaster opened in the Alton Towers theme park in 2010. Spinball has been ported to various consoles and included in Sega compilations. Sonic the Hedgehog Spinball is one of the few games in the Sonic franchise set in the universe of the animated series Adventures of Sonic the Hedgehog. The evil scientist Doctor Robotnik has built a large fortress on top of a volcano for the purpose of transforming the animals of planet Mobius into robot slaves. The magma within the volcano fuels both the fortress and the pinball machine-like defense systems that act as fortifications. The volcano is kept in stable condition by a series of Chaos Emeralds. In response, Sonic the Hedgehog and his friend Tails mount an aerial assault on the fortress only to be ambushed by the fortress's cannons. Sonic is knocked into the deep waters that surround the volcano, but manages to avoid drowning and surfaces in the caves below the fortress. From there, Sonic infiltrates the fortress's defenses, absconds with the Chaos Emeralds, and frees the animals of Mobius. In the absence of the Chaos Emeralds, a massive eruption begins to destroy the fortress. While Robotnik makes an escape attempt on a massive airship, Sonic pursues him and manages to destroy the aircraft, resulting in the pair plummeting to the volcano below. Tails manages to rescue Sonic just in time, while Robotnik falls into the volcano, which sinks into the ocean and explodes. Sonic Spinball is a pinball game in which the player controls Sonic the Hedgehog, who acts as the pinball. The majority of the game takes place within the "Pinball Defense System", which resembles a series of large pinball machines. The game comprises four levels, each containing numerous flippers that can be used to aim Sonic's trajectory and launch him through the level. Sonic can be maneuvered while airborne with input from the directional pad, which can be used for better positioning following an impact with a bumper or target or when Sonic is descending toward the drain, bumpers or flippers. The goal of each level is to collect all of the Chaos Emeralds and subsequently defeat the newly accessible boss located at the top of the level. Some Chaos Emeralds are blocked off by obstacles that require Sonic to hit certain switches or bumpers in order to create a clear path. The boss at the top of each level requires a specific strategy to defeat. A "status strip" at the top of the screen provides hints for defeating bosses as well as encouraging messages when the player makes progress. The strip also tells the player how many Chaos Emeralds are left to collect in a level. Following the defeat of a boss enemy, a bonus round is initiated. These rounds are shown as Sonic playing a regular pinball machine. The player is given three balls to shoot around the board, the object being to accumulate points by hitting as many bumpers and targets as possible. At any point in the bonus round, the player may trigger a tilt shake that rattles the table and affects the ball's trajectory. If the tilt shake is used too often, however, all flippers will lock out, leaving the ball to fall down the drain. When the goal of the bonus round is fulfilled, or if all three balls fall through the flippers, the bonus round will end, and the next level will commence. When all of the game's Chaos Emeralds are collected and all four boss enemies are defeated, the player wins. Sonic starts the game with three lives. A life is lost when Sonic falls through a drain. An extra life can be earned by accumulating 20,000,000 points, which can be accumulated by hitting bumpers, navigating through loops, collecting rings and destroying enemy characters. The marketing/research folks indicated that Sonic's casino levels were among the favorites, birthing the idea of the overall direction. I honestly don't know who came up with that, but it sounded fun and doable, so STI [Sega Technical Institute] jumped on it. Peter Morawiec in a retrospective interview with Retro Gamer. 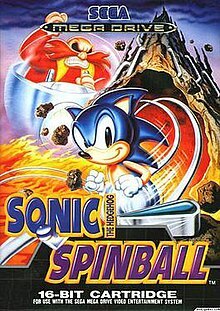 Sonic Spinball was developed by mostly American staff from Sega Technical Institute while the Japanese staff were producing Sonic the Hedgehog 3 and Sonic & Knuckles (then conceptualized as a single game). Sonic the Hedgehog 2 was credited with boosting sales of the Sega Genesis in the 1992 holiday shopping season. Sega of America's management realized that the next Sonic the Hedgehog title would not be ready until next year and commissioned another game that could be completed in time for the 1993 holiday season. Sega's research team suggested that the "Casino Night Zone" of Sonic the Hedgehog 2 was among the most popular levels in the game. This provided Peter Morawiec, the game's designer, with a general direction of the upcoming game. With an idea established, the developers envisioned a way of extracting the enjoyable aspects of this single level and expanding on them broadly enough to form a concept around which an entire game could be based. Morawiec drew inspiration from Pinball Dreams, a game released for the Amiga in 1992, to combine pinball mechanics with the gameplay of Sonic the Hedgehog. Collaborating with three colleagues, Morawiec designed basic animations depicting Sonic as a pinball. The animations were demonstrated to Sega's senior management, who approved the project. The development team knew that the game would have to be completed in under a year to be ready in time for the 1993 holiday season; a schedule Morawiec considered "tight" for a game which needed to capitalize on the series' new-found popularity in North America. In order to speed up production, Sega sent veteran staff from Japan to assist in development, including regular Sonic the Hedgehog artist Katsuhiko Sato. Despite the transfer of these staff, the game was still not predicted to be complete in time. As a result, Sega Technical Institute staff decided to change the game's programming language from assembly to C; an unusual choice for Genesis games at the time. In retrospect, Morawiec admitted that the choice to move away from traditional assembly language caused frame rate and optimization issues, but greatly accelerated the development process. In the space of 61 days between mid-June and August 1993, the project evolved from being a roughly playable build with no collision detection systems or character animations, to a fully completed game. Immediately before the game was due to ship, the team was informed that Sega did not own the rights of the Sonic the Hedgehog theme tune. Morawiec recalled that there was an uproar among the team after Hirokazu Yasuhara, the lead designer on Sonic Team, explained that the theme tune was owned by Japanese band Dreams Come True. As a result, Morawiec tasked the team's lead composer, Howard Drossin, to create a new theme within approximately two hours. Morawiec believed that the game would face "acceptance challenges" from both fans and the gaming media, as Sonic the Hedgehog Pinball strayed away from the traditional platforming genre. After returning home to the United States from Europe, Morawiec was surprised to find that the game had sold well, and was pleased that it benefited from the franchise's popularity. Nonetheless, he regretted that the team had lacked time to "polish" the game properly. After the Game Gear title Sonic Drift received poor reviews in Japan, Sega released an 8-bit port of Sonic Spinball for the Game Gear in its place worldwide in late 1994. It was also released for the Master System in Brazil and Europe in 1995. The 8-bit version is mostly identical to the Genesis game, albeit with downgraded visuals and different, more platforming-oriented bonus stages. The Master System version was released near the end of the console's lifetime and did not sell well, and became a valuable collector's item. The game has been rereleased on 11 different platforms. The Genesis version of the game has been rereleased on the Sonic Mega Collection compilation for the Nintendo GameCube, PlayStation 2, Xbox and PCs, Sonic's Ultimate Genesis Collection for the Xbox 360 and PlayStation 3, and multiple iterations of the Sega Smash Pack series of compilations. The Game Gear version appears as an unlockable game in Sonic Adventure DX: Director's Cut for the GameCube and PC, as well as Sonic Gems Collection for the GameCube and PlayStation 2. The game was intended to be included in the Sonic Classic Collection for the Nintendo DS, but was cut for unspecified reasons. The Genesis version was released on the Wii's Virtual Console on March 12, 2007 in North America and April 5, 2007 in Europe. An emulated form of the game was also made available for iOS devices via Apple's App Store in 2010, but was later removed along with other Sega games in 2015. On September 13, 2010, it was released on Steam. Sonic Spinball received mixed reviews. It holds an average score of 61% at GameRankings, based on an aggregate score of six reviews. The visuals were generally well received. A reviewer from Electronic Gaming Monthly thought that the game being set inside of a pinball machine was a novel idea, and also labelled the game's visuals, music, and sound effects as "top notch". In the same review, another reviewer opined that the graphics were not as "sharp" as other Sonic the Hedgehog titles, and also thought the sound was unimpressive. In a retrospective review, Lucas Thomas from IGN felt that the game's graphics matched those of later Sonic games on the Genesis, and considered Spinball's minigames to be "visually distinct and well-done." A reviewer from Jeuxvideo.com thought the graphics were "generally good", but indicated that there were other visually superior games for the Genesis. In similar vein, William Avery of GameSpot noticed that the game contained some slowdown. Eurogamer's Dan Whitehead criticized the game's sluggish frame rate and slowdown that occurred when "things threaten to get hectic" in-game, noting that it suffered from "the old Mega Drive problem". Various aspects of the gameplay garnered a mixed reception from critics, though the game's control scheme received the most criticism. A reviewer from GamePro criticized the control configuration and felt that the game was a mediocre example of a pinball game, but admitted that it had a similar feel to previous Sonic the Hedgehog titles. Jeuxvideo.com's reviewer enjoyed how Sonic himself acted as a pinball, but noticed that the controls were less precise and responsive when compared to other platformers. Dan Whitehead asserted that the game's controls were "muddled by the half-and-half approach", and criticized its "clunky" game engine, saying that the game's control scheme ruined the pinball environments. Thomas stated, "There are aspects of the control that could have been tighter, and its difficulty level may be a bit too extreme for new players." Damien McFarren from NintendoLife said that the game comes across as both a poor platformer and a poor pinball game due to its unconvincing ball physics and frustrating platform elements. Bob Strauss of Entertainment Weekly felt that the game initially boasted a terrific concept, but had an ultimately flawed execution, saying that Sonic, acting as a pinball, often moved like a "leaden marble". Rich Leadbetter from Mean Machines also expressed concern over the game's lack of replay value, saying that despite its addictive gameplay, the game's four levels were not enough, especially given its high price. A second pinball game in the series, Sonic Pinball Party, was released for the Game Boy Advance in 2003 to generally favorable reviews. In 2010, a spinning rollercoaster, Sonic Spinball, opened in the Alton Towers theme park in Staffordshire. Although the rollercoaster was not originally designed with a Sonic the Hedgehog theme, the ride became part of a sponsorship deal between Sega and Alton Towers. A Sonic the Hedgehog-themed hotel room was later made available at Alton Towers Hotel, which featured various playable Sonic the Hedgehog games, as well as wallpaper based on Sonic the Hedgehog 4: Episode I. ^ Leadbetter 1993, p. 109. ^ "Sonic Spinball (Genesis) overview". IGN. Ziff Davis. Archived from the original on July 2, 2015. Retrieved October 22, 2017. ^ "メガドライブ". SEGA ソニックチャンネル (in Japanese). Sonic Team. Archived from the original on August 27, 2017. Retrieved October 22, 2017. ^ "Sonic the Hedgehog Spinball for GameGear - overview". GameRankings. CBS Interactive. Archived from the original on October 22, 2017. Retrieved October 22, 2017. ^ a b c d e "Test Sonic Spinball sur MD". Jeuxvideo.com (in French). Webedia. January 29, 2010. Archived from the original on October 21, 2017. Retrieved February 13, 2017. ^ a b Sega Technical Institute 1993, p. 7. ^ Mean Machines staff 1993, p. 11. ^ Sega Technical Institute 1993, p. 2. ^ Sega Technical Institute 1993, p. 3. ^ Sega Technical Institute 1993, p. 8. ^ Leadbetter 1993, p. 70. ^ Sega Technical Institute 1993, p. 8-9. ^ a b c d e f Thomas, Lucas (March 27, 2007). "Sonic Spinball VC review". IGN. Ziff Davis. Archived from the original on September 18, 2017. Retrieved February 11, 2017. ^ Sega Technical Institute 1993, p. 13. ^ a b "SEGA Flips Sonic Spinball App into the App Store". IGN. Ziff Davis. December 16, 2010. Archived from the original on February 18, 2017. Retrieved February 17, 2017. ^ Sega Technical Institute 1993, p. 15. ^ Sega Technical Institute 1993, p. 17. ^ Sega Technical Institute 1993, p. 11. ^ Sega Technical Institute 1993, p. 14. ^ a b c d Machin 2011, p. 37. ^ Retro Gamer staff 2007, p. 30. ^ a b c Machin 2011, p. 38. ^ Machin 2011, p. 38-39. ^ a b Machin 2011, p. 39. ^ "First Shots". Computer and Video Games (151): 11. June 1994. ^ Thorpe, Nick (March 22, 2014). "The History of Sonic on the Master System". Retro Gamer (179). ^ Liu, Johnny (January 12, 2002). "Sonic Mega Collection Review". GameRevolution. CraveOnline. Retrieved February 17, 2017. ^ Gilbery, Henry (February 12, 2009). "Sonic's Ultimate Genesis Collection review". GamesRadar. Future plc. Archived from the original on February 11, 2017. Retrieved February 17, 2017. ^ Provo, Frank (October 8, 2002). "SEGA Smash Pack Review". GameSpot. CBS Interactive. Archived from the original on October 22, 2017. Retrieved February 17, 2017. ^ "Sonic Adventure DX: Director's Cut Cheats, Codes, and Secrets for GameCube". GameRankings. CBS Interactive. Archived from the original on July 1, 2017. Retrieved February 17, 2017. ^ Bramwell, Tom (October 6, 2005). "Sonic Gems Collection". Eurogamer. Eurogamer Network. Archived from the original on August 16, 2017. Retrieved February 17, 2017. ^ Carter, Chris (August 18, 2015). "Crazy Taxi 4 pitch revealed by former SEGA employee". Destructoid. Archived from the original on April 1, 2017. Retrieved October 22, 2017. ^ Shea, Cam (March 20, 2007). "Sonic Spinball rolls to AU and UK Virtual Console". IGN. Ziff Davis. Archived from the original on February 18, 2017. Retrieved February 17, 2017. ^ "Sonic Spinball for iOS". Metacritic. CBS Interactive. Archived from the original on 27 March 2017. Retrieved 17 February 2017. ^ Musgrave, Shaun (19 May 2015). "SEGA Culls Their App Store Catalog: Here's The Hit List". TouchArcade. TouchArcade LLC. Archived from the original on 27 March 2017. Retrieved 21 October 2017. ^ Nunneley, Stephany (September 14, 2010). "More Sega Genesis games added to Steam". VG247. Archived from the original on October 21, 2017. Retrieved February 17, 2017. ^ a b "Sonic the Hedgehog Spinball for Genesis". GameRankings. CBS Interactive. Archived from the original on March 4, 2016. Retrieved February 11, 2017. ^ a b c Electronic Gaming Monthly staff 1994, p. 48. ^ a b c d Whitehead, Dan (May 18, 2007). "Virtual Console Roundup". Eurogamer. Eurogamer Network. Archived from the original on September 4, 2017. Retrieved February 13, 2017. ^ a b c GamePro staff 1994, p. 136. ^ a b McFarren, Damien (March 13, 2007). "Review: Sonic Spinball (Virtual Console / Sega Mega Drive)". Nintendo Life. Archived from the original on September 27, 2017. Retrieved February 13, 2017. ^ a b c Strauss, Bob (February 11, 1994). "Sonic CD; Sonic Chaos; Sonic Spinball; Sonic 3 reviews". Entertainment Weekly. Time Inc. Archived from the original on October 21, 2017. Retrieved February 13, 2017. ^ a b Leadbetter 1993, p. 72. ^ Score, Avery (November 2, 2004). "Sonic Mega Collection Plus Review". GameSpot. CBS Interactive. Archived from the original on September 18, 2017. Retrieved February 13, 2017. ^ "Sonic Pinball Party for Game Boy Advance". Metacritic. CBS Interactive. Archived from the original on August 29, 2012. Retrieved February 13, 2017. ^ Sterling, Jim (January 9, 2010). "Sonic Spinball rollercoaster coming to UK theme park". Destructoid. Archived from the original on November 3, 2012. Retrieved October 22, 2017. Electronic Gaming Monthly staff (March 1994). "Crew review: Sonic the Hedgehog Spinball!". Electronic Gaming Monthly. No. 53. Bath: Future plc. p. 48. ISSN 1058-918X. GamePro staff (September 1994). "ProReview: Sonic the Hedgehog Spinball". GamePro. No. 62. IDG Entertainment. p. 136. ISSN 1042-8658. Machin, Cole (January 2011). "The Making of: Sonic Spinball". Retro Gamer. No. 85. Bournemouth: Imagine Publishing. pp. 36–39. ISSN 1742-3155. Mean Machines staff (August 1993). "CES Show: It's Sonic Mania in Sonic Spinball!". Mean Machines. London: EMAP (10): 11. Retrieved October 21, 2017. Leadbetter, Rich (December 1993). "Sonic the Hedgehog Spinball review". Mean Machines. London: EMAP (14): 70–72, 109. Retrieved October 21, 2017. Retro Gamer staff (March 2007). "Company Profile: Sega Technical Institute". Retro Gamer. No. 36. Bournemouth: Imagine Publishing. pp. 28–33. ISSN 1742-3155. Sega Technical Institute (August 1993). Sonic the Hedgehog Spinball instruction manual. Sega. pp. 1–22.